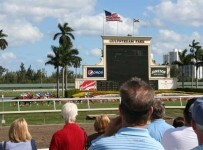 Gulfstream Park has a 12-race program on Saturday, with first post of 12:45 p.m. The featured tenth race is a $43,000 allowance at one mile on turf for three-year-olds and up. 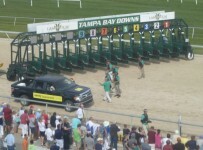 The Rainbow 6 carryover for Saturday is $67,456.91. It is on races seven through twelve. On Saturday Oct. 1, the closing day of the summer meet, there will be a mandatory payout of the full Rainbow 6 carryover/jackpot—even if there is more than one ticket with the winners of all six Rainbow 6 races. On Oct. 1, Gulfstream will have eight stakes races, including the third and final legs in the four divisions of the Florida Sire Stakes Series. In this Saturday’s first race, there will be an overnight carryover of $1,186.51 in the Super Hi-5. In Friday’s ninth and final race, there were no tickets with the requirement of the first five finishers in correct order. 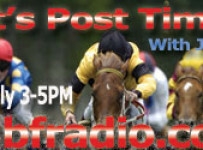 On Sunday, Gulfstream has a ten-race program with first post of 1:15 p.m.